I wonder what the stats are regarding the number of tourists ending up in the hospital because they looked the wrong way when crossing the street in countries that drive on the left. I know I’ve had a close call or two! And I am sure the stats on car accidents caused by tourists must be staggering. But, here we were, joining the fray in our rootbeer brown rental car chanting “keep left!” every time we pull into traffic. Especially out of parking lots and side streets. Fortunately, we lived in London for five years (although that was thirty years ago) so we have a bit of muscle memory left from our driving days way back when. Since leaving Auckland we've driven 500 scenic miles down the middle of the North Island with stops in Rotorua, Taupo, Napier, and Wellington. We certainly wouldn't have been able to experience the rugged beauty of this country without a car. The well-maintained, winding countryside roads are fun to drive so we plan to do it all again on the South Island. Still haven't seen a Kiwi bird. But we did see spectacular scenery around every bend. Rotorua was our first destination. 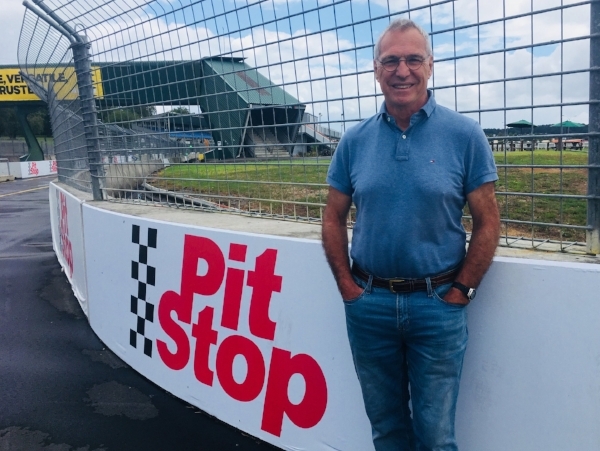 If you read our Kiweek Two post, I made reference to Michael’s former racing career and his desire to visit some of the tracks where he competed in his Formula 5000 almost 50 years ago. Pukekohe Park Raceway where he raced in the Tasman Series was right on the way. It didn’t look quite the same, but there was enough of the “ghost of racing past” to spark fond memories for Mr. Campbell. Hopefully, we will visit a couple more. Having a look around one of the racetracks where Michael competed in 1970. To make our lifestyle work we almost always choose an entire house on Airbnb because that allows us to enjoy our privacy during long stays. But when we take these occasional road trips where we have one or two night stays, we often opt for a private room in a house. That also brings the cost down and helps balance out the expense of renting a car. However, it also adds uncertainty around just how “private” our room will be. 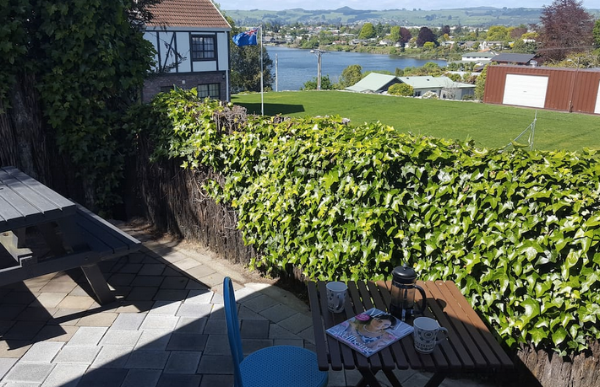 The lake view from the courtyard of our private-room Airbnb in Rotorua. Our first home-on-the-road was a complete wing of a beautiful private home with a view of Lake Rotorua. We had our own entry, a sitting room, a small kitchen, a big bathroom and a comfortable bed. The only way you’d know it wasn’t an entire home is that you could hear the family through the adjoining walls. Our host was great and gave us tips on where to dine that night, and what to see the next day during our drive to Taupo. Rotorua is known for its geothermal parks where you can witness spewing geysers as you stroll on boardwalks across boiling ponds, and peer into steaming pools of bubbling mud. We saw a bit of that in the free access park in the very center of the city and decided living downwind from the sulfur smell could definitely affect property value. We skipped the larger parks. We took a walk through the thermal park in the center of town - not your average garden setting. After lunch we set the GPS for Taupo. But first, we stopped at the Whakarewarewa Forest . We walked among giant 200-year-old Redwood trees that stretched over 200 feet skyward and stood under the shade Wheki Fern trees that topped out at 65 feet. It made us reflect on just how short our time is here on earth. And how far we had to drive. Time to go. "Tramping" in the forest. I like the local word for a good walk in the countryside! It rained during most of our three-hour drive so we didn’t get to take in much of the scenery, but we enjoyed the rolling countryside and, believe it not, found plenty of things to talk about. You’d think after four and a half years of spending 24 hours together we couldn’t muster much of a conversation. But get us going on the latest news, our current president and the state of our union and we have to be careful not to start boiling ourselves. We arrived safely in the tourist hub of Taupo and found our lodgings for the night - a fairly new, 24 ft. campervan parked safely in the host's driveway. Perfect! We could get the feel of touring NZ in one of these beasts and never hit the pavement. 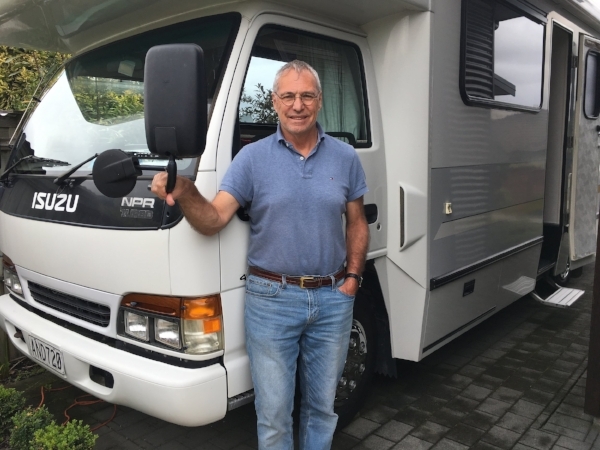 When we were planning this journey we did briefly consider renting a motorhome but not only is it very expensive, it would have added another layer of anxiety to the daunting task of driving on endless winding roads....on the left. The perfect way to try out a campervan without leaving the driveway. Our hosts, Stephanie and Neil, were very good at keeping guests happy in such a small space and we found all the comforts of home. After learning our route for the next day, they found us discount tickets to Waikite Resort Thermal Day Spa right on our way. 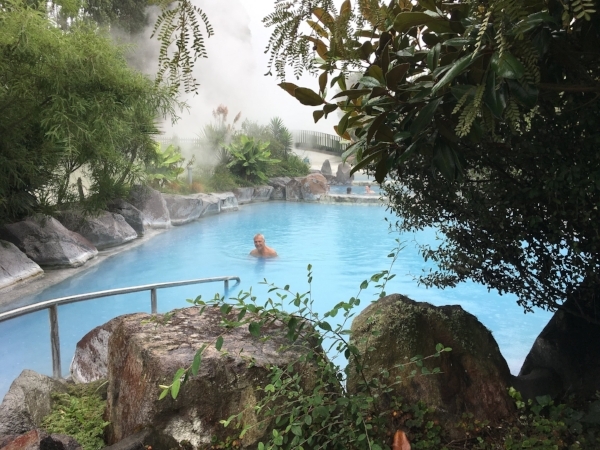 We were able to spend time soaking up the mysterious health benefits of 24 different minerals (including arsenic) that come from submersion in geothermal pools. I’m not sure it was life-changing, but it was certainly pleasant to sit quietly in steaming water under a gentle rain. After an hour of drifting between gradually hotter pools with an occasional dunk in the coo-lish one we were ready to move on. Soaking up the geothermal benefits in the rain. Our last stop on this stretch was a look at the Huka Falls - a roaring, sea-foam green juggernaut of water pounding through a narrow canyon. We were happy to be high and dry and not on the jet boat full of tourists being spun around at great speed and getting soaked by the spray. Our destination for the night was Napier. Unfortunately, a large part of this seaside city was destroyed in an earthquake in 1931. Determined to rebuild, the city planners adopted the style of the times and created filled the town with handsome Art Deco buildings. 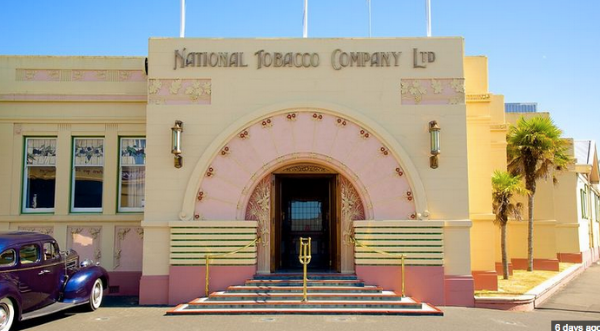 Just one of dozens of architectural wonders in Napier. We didn’t get to see much since our windshield wipers were having trouble keeping up with the rain, so we headed slightly out of town to our next room for the night. As we wound our way to the top of a high hill we glimpsed the ocean and the city below. At the end of a long private drive we found the large and very attractive home where we would spend the night in "The Romeo Room" with its own bath, and, if the rain let up, an amazing view. Our host Chia greeted us at the door and introduced us to family members as we made our way past the living room and upstairs. This is always the awkward bit. Do we stay in our room? Do we come down and watch TV with the gang? Can we put our stuff in the fridge? We shouldn't have worried. Hosts with this type of listing love having guests (or they wouldn’t do it) and always go out of their way to make you comfortable. "Of course you can use the fridge. And eat whatever you find inside!" "The Romeo Room" with a view on a sunnier day. Our room was beautiful and a quick “lie down test” on the bed indicated a winner. Now we just needed to fill the evening. We headed back down the hill to dinner at a restaurant recommended by our host called Three Doors Up. We were fortunate to get the last available table and Chia didn’t steer us wrong. I finally had the delicious New Zealand steak dinner I’d been hankering for, and Michael enjoyed his chicken, but the warm lemon meringue tart with just churned vanilla ice-cream was perfection. We woke up to pounding rain, so we didn’t rush to get on the road to Wellington. Instead, we had a nice visit over breakfast with our hosts and learned more about their large Greek family. The skies cleared a bit and it was time to brave the five-hour drive. The time passed quickly as the captivating landscape painted with vineyards and orchards gave way to the city. 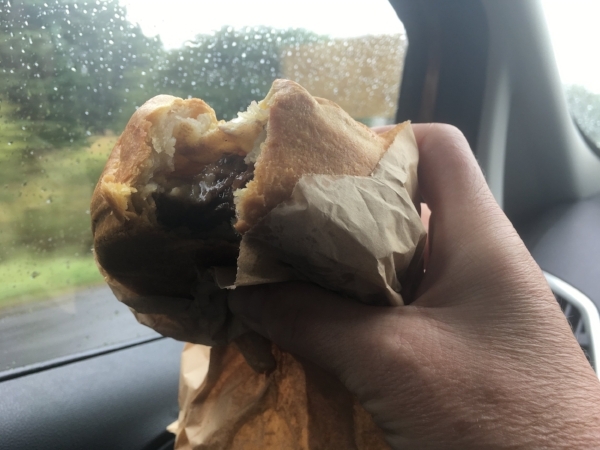 The car had to be back by 5:30 pm so there weren’t any stops other than to fuel-up and gobble-down a very delicious Steak and Cheese Pie. When we reached Wellington we needed to find our Airbnb, drop off our bags and then find the rental drop-off point. There is always a little trepidation when approaching an unknown city by car. This is where keen relationship skills come into play. And, if you are the navigator you need to have your lefts, rights, and roundabouts in order. Thankfully we found our place with very little trouble. Our host Stephanie was there to greet us and showed us our tiny apartment tucked under the main house. It was delightful. A perfect “Hobbit House” with a view of the water and just a short walk to the village where we could get back to taking the bus! Our hosts Stephanie and Janet took great care of us in Wellington. Including dropping by with fresh goodies from the garden. Stephanie followed us to the car rental return lot and then took us grocery shopping. Later Janet brought us a bowlful of homegrown tomatoes and basil to round out the pasta dinner simmering on the stove. It was great to be cooking again. The next day we spent the morning at the farmer’s market where I gathered more stone fruit and vegetables that we could possibly use, along with fresh bread, Manuka honey and a small round of tangy goat brie.The coffee continues to be phenomenal, my Flat White paired well with a double order of bite-sized Dutch pancakes glazed with salted butter and a generous flurry of powdered sugar. 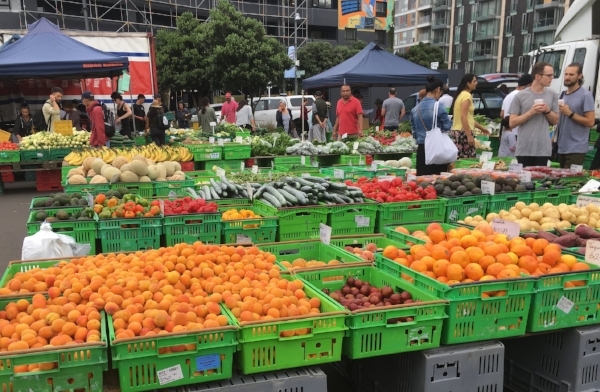 The Harbourside Market in Wellington offered bins full of fresh fruit & veg along with a long row of food vendors and at least five different coffee carts. Wellington is New Zealand's capital and a charming harbor city. After suffering damage from recent earthquakes, new building codes are in place so existing buildings have been fortified, restored nineteenth-century structures hug the waterfront and gleeming new skyscrapers shoot-up like weeds in the background. Wellington is still postcard perfect with many of its historical buildings carefully preserved. Sheds that serviced centuries of shipping commerce have been turned into galleries, restaurants, shops, and green pocket parks curl around the waterfront and bring green spaces to the downtown core. We took the restored funicular railcar up to the top of Kilburn Hill for a panoramic view followed by a meandering walk down through impressive botanical gardens. On our last day, we took a tour of the Te Papa National Museum where the history of New Zealand unfolds. The displays were all very well done - and in the interactive section on earthquakes you could enter a small wooden house and experienced what it was like to to be shaken like a piggy bank. It brought back sharp memories of our own 45 second, 6.8 earthquake in Seattle in 2001. I remember cowering under a small meeting room table with some close colleagues where we declared our love for each other - just in case. The highlight of the museum was a huge WW I exhibit called Gallipoli: The Scale of our War. We were totally unprepared for what lay behind the entrance. After a bit of background on New Zealand's participation in World War I you turned a corner and literally jumped backwards. Right in front of you was an enormous figure of an enraged soldier pointing a pistol at your head! There are several rooms in the exhibit, each holds figures 2.5 times larger than mere mortals. They were both frightening and intriguing - and hyper-realistic. There was even fine hair on the soldier's arms and a permanent tear rolling down a nurses cheek. every detail was to scale. There were moving personal stories about each figure we saw, and several other displays that would have been considered spectacular on their own. 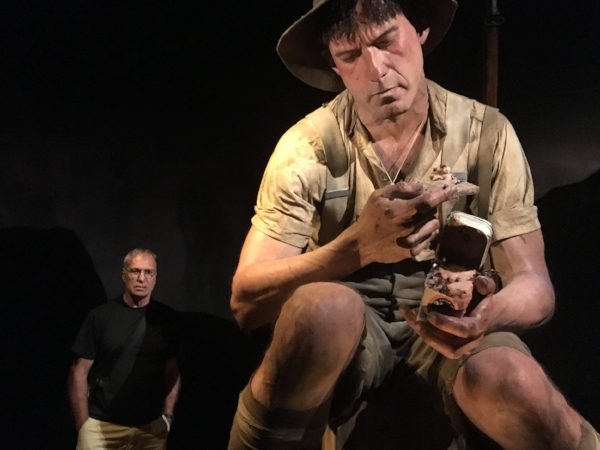 The project was conceived by the famous New Zealand film director Sir Peter Jackson, and the models were created by Wellington’s Weta Workshop known for their work in Lord of the Rings and Avitar. Here is some background on how the exhibit was created. Definitely worth a look! Weta Workshop's co-founder and creative director Sir Richard Taylor with models. Michael beside one of the figures for scale. Leaving Wellington behind, we took a ferry across Cook Strait (fortunately in calm waters) to the South Island. While onboard we met our doppelgängers! More on that, and our road trip down the wild west coast coming next.